Velvet Paw Creations: Friends - The East Wind DT inspiration for today's new release! Friends - The East Wind DT inspiration for today's new release! Today's new release over at The East Wind is this lovely Aurora digi called 'Take care of my cat'. I just adore cats and enjoyed creating this piece immensely! I printed the digi onto Neenah solar white cardstock twitce, first the full image and then just her left arm, a portion of the cat and her right hand. I coloured her with the following Copics: E0000, 00, 01, 02, 15, W0, Y15, 17, 38, YR04, B000, 00, 01 and 02 and added touches of white gel pen for highlights and metallic gold gel pen on her two buttons. I fussy cut out her arm and kitty and then layered it onto the main image with pop dots just along the and the cat and adhered her sleeve in place with Scotch Quick Dry adhesive to create an angled 3D effect. I used brown Derwent pastel blended with a Dove Blender pen on the background, rounded the corners with a Marvy corner rounder punch and applied Black Soot Distress Ink on the panel edges. I then cut a mats from green cardstock and a decorative paw print paper and used the corner punch on just the DP. I created a decorative dove tailed strip from a piece of the green cardstock cut off and added faux stitching details to all the panels with a white Dylusions paint pen. 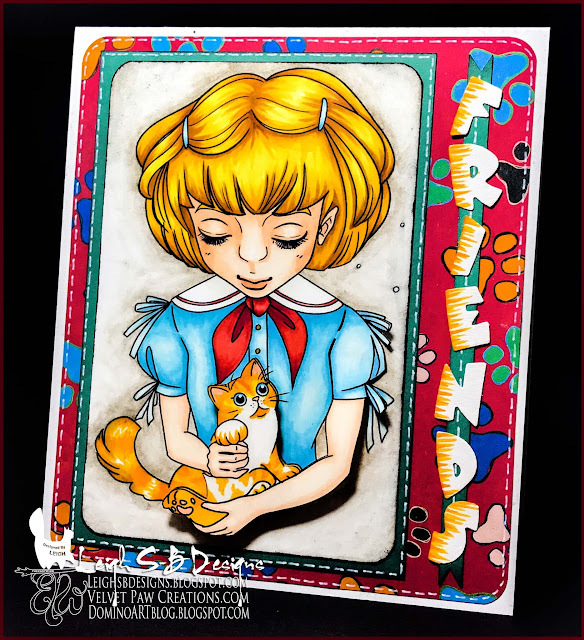 I die cut out the word "Friends" using a Sizzix Easy Peasy alpha die strip and added Copic 'fur' for a touch of fun detail. Everything was then adhered with tape to a white folded card made from a sheet of cardstock and the letters adhered in place with Scotch Quick Dry adhesive.